So to no one surprise, the Haste Spell was officially announced today! It will be the third Dark Spell Factory spell after the Poison and the Earthquake Spell. How does the Haste Spell Work? The Haste Spell is VERY similar to the Rage Spell. 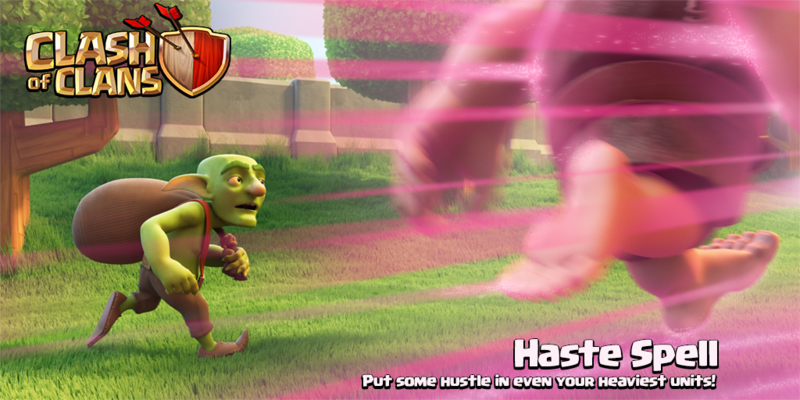 The Rage Spell increases damage and speed, while the Haste Spell only increases the speed of your troops. Keep in mind though, the Haste Spell takes up only 1 spell space, while the Rage Spell takes up 2 spell space. The Haste Spell will be key to attack strategies that use the Rage Spell only as a speed boost and that doesn’t need the extra added damage. LaLoonion and Mass Drag attacks will be using the Haste Spell over the Rage Spell now. However, some still do need the damage from the Rage Spell, so GoWiPe and Giant-Healer attacks won’t change much. So the Haste Spell is going to change a lot of different strategies soon. It is nice that it only takes up 1 spell space as well. Unfortunately, it isn’t looking like this update will come in June, but rather July. Unless Clash of Clans is planning something else MAJOR then my guess is that we will see the update sometime tomorrow. Hopefully we will see all of the update features then. Does it make the troops faster than the rage? I think it wouldn’t be worth much otherwise. Also what town hall level is the dark spell factory unlocked at? Yes, but remember it only takes 1 space while the rage takes 2. So it does make the troops faster than a rage spell? Yes, Haste has bigger speed increase than the rage spell. Can you use both at the same time for extreme effects? Hmm, my guess would be no.